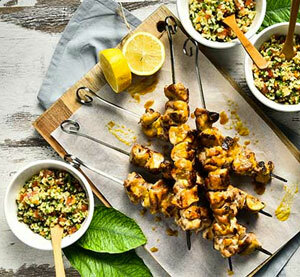 Chicken thigh skewers with honey, lemon and mustard, served on Mediterranean groats with vegetables. Put the vegetable broth in a pot and bring to a boil. Add the groat, allow it to simmer for 1 minute, remove it from the fire and leave it covered for 24-26 minutes. When the groat is ready, strain it, cool it under plenty of running water and place it in a bowl. On a cutting board using a mandolin slicer, thinly slice the carrot, zucchini and cucumber, omitting the center with the pips. On a cutting board using a sharp knife, cut the carrot, zucchini, cucumber slices, as well as the tomato into very small cubes. Chop the spring onion and parsley. Add the finely chopped vegetables to the bowl with the groats, drizzle with 60 ml of olive oil, add the zest, the juice from ½ lemon, salt and freshly ground pepper and stir well. On a cutting board use a sharp knife to cut chicken thighs into bite-size pieces, and place them in a bowl. Add the 4 tablespoons of olive oil, 40 ml of lemon juice, the honey, the oregano & thyme mustard, salt and freshly ground pepper and mix well. Skewer the pieces of chicken thighs on wooden skewers and place them in a baking dish. Place a non-stick grill pan over high heat and cook chicken skewers on all sides for 9-10 minutes in total. Serve the Mediterranean vegetable groats together with the chicken skewers.